“It was important for shrimpers to participate in Antibiotics Awareness Week because the seafood industry can and must take actions to stop drug resistance. The FDA has not approved any antibiotic for use in shrimp aquaculture. 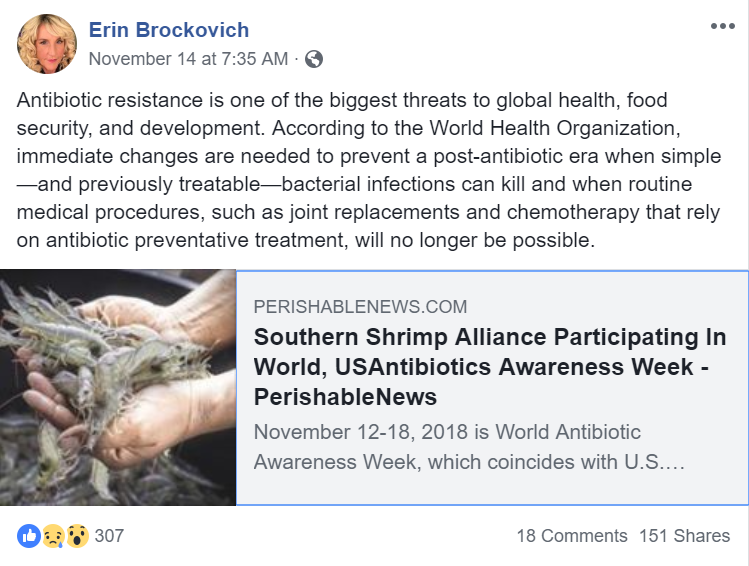 Any unauthorized use of antibiotics in shrimp farming, whether detected or not, can lead to antibiotic resistant bacteria,” said John Williams, executive director of the Southern Shrimp Alliance. All of the top antibiotics used in aquaculture are included on the World Health Organization’s list of critically/highly important antibiotics for human health and the number of publications linking drug-resistant bacteria to seafood has increased by 800% over the past three decades. Antimicrobial resistance from environmental pollution is among the biggest emerging health threats according to the United Nations Environment Programme (UNEP), which found that up to 75% of antibiotics in aquaculture can be lost into the surrounding environment, leading to antimicrobial resistance. In a 2017 peer-reviewed study, scientists deemed aquaculture systems and farms to be “hotspots for AMR genes,” where significant genetic exchange and recombination can occur to shape the evolution of future resistance profiles. They went on to demonstrate that such mutations are already occurring and that the effects will last longer than the practices. Canada, EU, Switzerland, Australia, Japan, & Korea have acted—often more so than the US—to eliminate antibiotic-tainted shrimp from their food supply. This makes the US the largest, most open market for shrimp contaminated with banned antibiotics. The FDA tests for a limited number of antimicrobial agents including antibiotics, antivirals, antifungals, and biocides in seafood. Less than .1% of seafood is actually tested, yet every month—many times from the same bad actors—FDA finds residues of antibiotics prohibited in food production. Additionally, shrimp farmers may switch to critically/highly important antibiotics not tested by FDA, as found by the European Commission. As a result of an April 2018 audit on Indian aquaculture, the European Commission recommended expanding testing to four types of antibiotics. 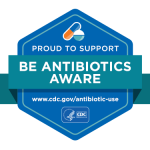 These classes of antibiotics have important therapeutic applications that are endangered by development of antimicrobial resistant bacteria. The actions in Europe suggest FDA’s list is incomplete. Foreign shrimp farmers use antimicrobals for non-therapeutic purposes—to promote growth, weight gain, disease prevention—and inappropriately, such as to treat EMS and other viruses. 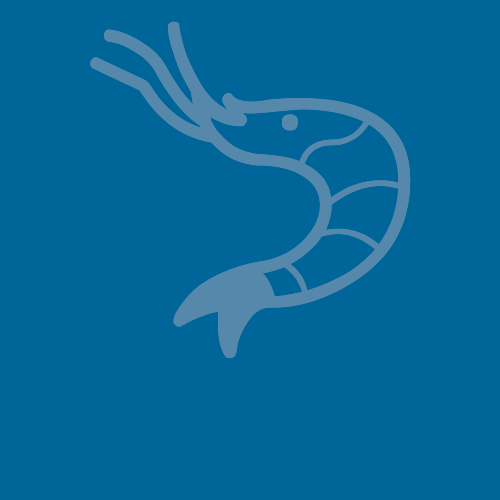 Much of the world’s farmed shrimp supply is raised in developing countries by poor farmers with little economic security. Medicated feed, some of which include banned antibiotics, are sold to peasant farmers to help safeguard their crop. The FDA depends on the action of foreign processors and U.S. importers to help ensure the safety of imported seafood from unsafe drug residues. Bacteria are becoming resistant to antibiotics faster than scientists are developing new ones, leading us to a world where currently treatable infections may kill more than cancer by 2050. U.S. Government Accountability Office. “IMPORTED SEAFOOD SAFETY: FDA and USDA Could Strengthen Efforts to Prevent Unsafe Drug Residues,” GAO-17-443: Published: Sep 15, 2017. Publicly Released: Oct 2, 2017.